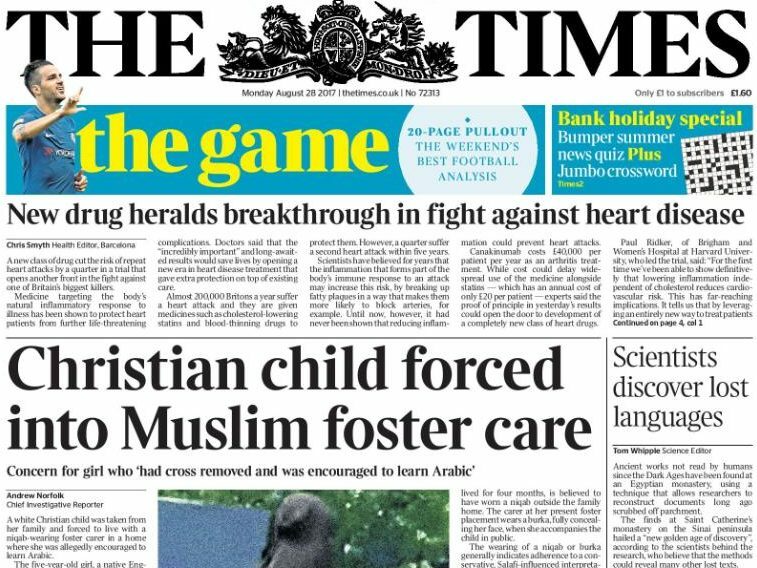 The exclusive Times story claiming a five-year-old girl from a Christian background had been “forced” into foster care with Muslim families has resulted in 178 complaints being made to the newspaper’s regulator. The Independent Press Standards Organisation (IPSO) said the majority of complaints against the article fell under three clauses of the Editors’ Code of Practice: accuracy, privacy and discrimination. The story, published on Monday last week and headlined: “Christian child forced into Muslim foster care”, was also picked up by the Daily Mail. The Mail attracted 14 complaints for its coverage, according to IPSO, and drew criticism for using a stock image of a Muslim family and adding a veil to the woman’s face to illustrate the article. The story had been based on an inside source at Tower Hamlets Council and further probes by Times chief investigative reporter Andrew Norfolk. It included images of the girl with her foster carers, who were wearing religious garments. The Times followed up on Wednesday with a second story reporting a family court decision the day before to pull the five-year-old girl out of foster care and place her with her grandmother. Judge Khatun Sapara said the paper had raised “very concerning” matters of “legitimate public interest” through its investigation, but took the unusual step of publishing details of the case. The judge made it clear her decision had been based on the evidence before the court and was not the result of “undue media involvement”. Tower Hamlets mayor John Biggs told the BBC’s Today programme that some of the more “sensationalist” elements of the Times report – including claims the girl had her crucifix necklace removed and was banned from eating bacon – were “not based in fact”. Claims that the families did not speak English were also rebuffed by Tower Hamlets Council, which said in a statement it was “disappointed with the tone of some of the media coverage”. They said: “While we cannot go into details of a case that would identify a child in foster care, there are also inaccuracies in the reporting of it. The court documents also revealed that the girl’s grandmother was from a Muslim background but was non-practicing, seemingly contradicting the mother’s claim that the family is of “Christian heritage”. The grandmother has also told authorities she wishes to “return to her country of origin and care for the child there”, the documents revealed. In defending his investigation, Norfolk told the BBC: “These are difficult and sensitive issues. My job as a reporter when matters that on the face of it raise serious concerns are brought to our attention, my job is to investigate them. If had my way there wouldn’t be any story to write, muslim’s wouldn’t be allowed foster care. A daft response. Reflecting a lack of any real understanding, rather like the original story.